In 1931, a group of civic-minded citizens led by humanities professor and climate scientist Dr. James Church and local art collector Charles Cutts, established what is today known as the Nevada Museum of Art. Sixty years later, in 1993, a major endowment gift from the Carol Franc Buck Foundation established the Altered Landscape Photography Collection that is now one of the institution’s largest focused collecting areas with approximately 2,000 photographs. In these images, artists reveal the ways that individuals and industries have marked, mined, toured, tested, developed, occupied, and exploited landscapes over the last fifty years. 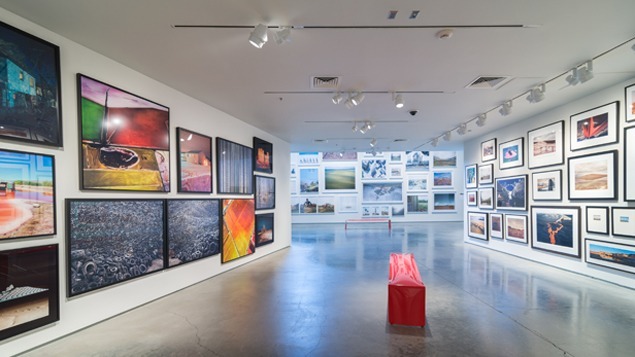 While the image makers take various approaches, together they offer a panoramic sweep of the contentious social and political debates that have shaped contemporary discourse on the changing environment. Held in trust for future generations, an art museum’s permanent collection reflects the values and identity of the community it serves. The photographs in this exhibition are hung on the walls in a manner known as “salon style.” The term refers to the centuries-old French tradition of displaying art in large, grand gallery spaces as a backdrop for conversation and dialogue. In private French homes, invited guests would gather in salons (or grand living rooms) to discuss art, history, politics, and other important matters of the day. Beginning in 1737, the Royal Academy of Painting and Sculpture in Paris re-invented the idea of the salon when they opened their student exhibitions to the general public for the first time. Not only were all community members invited to attend salons, visitors were encouraged to debate and share opinions about the works on view—much like what happens in many art museums today.